HomeEventsThis man pressed Print. What happened next left me speechless. This man pressed Print. What happened next left me speechless. Although I attended HP Discover in Barcelona as a guest of the folks at HP Networking (via their Independent Bloggers program), I didn’t restrict myself to looking at etherstuff; HP makes way too broad a portfolio of products to get away with that. I ended up looking at printers, and I found something that pretty much blew me away. Before I forget, please accept my apologies for the clickbait headline. I’ve always wanted to do one of those; but unlike so many others I’ve seen, I hope that this article won’t disappoint. You’ll see “the man” in the headline in a video later. Given the price I just found for the LX850 online (list of 180,000 UKP in 2012, which is around $275,000), you might actually buy the HP LX850 then live in a van down by the river. 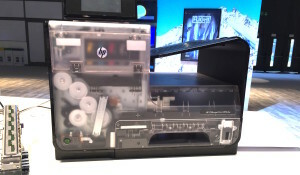 The point is that HP can rightly claim to have a little printer expertise, and you’d better believe it. You’d think with these amazing printers that we had learned everything we needed to know from the previous generations of printers, but it turns out that maybe there’s still a trick or two we can reuse even today. Lets try an Age Test. Do you know what this is? Most importantly, line printers are faster than regular (serial) dot matrix printers. Perhaps the ideal speed improvement might be if you could have a single line of pins or hammers covering the entire page width, so each impact prints an entire line of dots. But who would do something crazy like that? 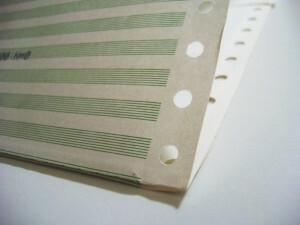 Inkjet print heads are not amazingly dissimilar to the original dot matrix. The main difference is that there are many more, smaller nozzles (dots), but in operation things work pretty much the same; the head moves side to side across the paper as the nozzles spray very fine dot patterns in sequence across each line. 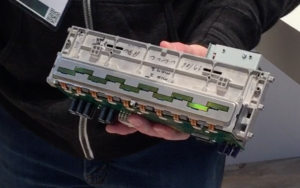 HP’s funky idea was to say fine, so how about an inkjet version of them line matrix printers? You can see the ten print heads here, each of which has 4,200 nozzles, so the total count is 42,000 nozzles. That’s a fairly decent step up from a 9-pin dot matrix! This monster print head then gets put into the HP OfficeJet Pro X, truly the only printer I’ve seen in years that has made me think that when my color laser printer dies, I might go back to ink instead. The print speed is simply astounding. At full quality (“Professional Mode”), the printer spews out an impressive 42 pages per minute. Change to “General Office Mode” which uses a little less ink and reduces quality very slightly (though in the samples I saw, the difference was not immediately obvious) and the rate rises to an amazing 70ppm if you have the faster model. Perhaps unsurprisingly one of the available models, the HP OfficeJet ProX551dw, holds the Guinness World Record for the fastest desktop printer. I’ve always hated inkjet for their smudgy inks, but the ink used by the OfficeJet Pro X series does not smudge. In the video I’ll upload, you’ll see it having water poured on a printout and rubbed in, and the ink doesn’t run. This is not new, but it’s a significant improvement over many other inkjet out there. I also hate that if you pick a printout up too soon after printing, the ink hasn’t dried yet. The OfficeJet Pro X actively dries the ink as part of the print mechanism, and by the time it comes out it’s dry. That’s handy because when you’re printing at that speed the paper will pile up pretty quickly and you’d have newly printed output merrily staining the pages below them as they fell. It turns out that the underlying print engine will in fact run at over 100ppm, but the limiting factor right now is the drying capability; HP can only dry the paper at 70ppm. Isn’t technology fun? The ink, I’m delighted to say, is entirely separate from the print head. This is probably a good thing. Can you imagine the cost? The print cartridges are brainlessly simple to remove and insert, making this possibly the most user-friendly inkjet I’ve ever seen. Check the video below to see how it works. I have heard that for best results you may need to use HP ColorLok paper, but I can’t verify that, not compare to a good alternative, since I don’t have one to try. For sure, if you run any inkjet on regular low grade copier paper, it’s going to be a bad relationship, but this is a factor I would want a little more information on before I committed. The show floor is a noisy environment but I encourage you to take a few minutes and watch it if you haven’t seen this printer in action before, because it’s like nothing else I’ve seen. This step up in the capabilities for desktop printing is impressive. It’s a shame that it won’t help with those massive DesignJet printers that take twenty painful minutes to print out a visio network diagram only to discover at the end that there’s a problem with the diagram. Ah, well HP thought of that too. They took the PageWide concept and appear to have said something along the lines of “Why stop at 10 print heads? We can use ONE MEEEEELEEEON PRINTHEADS!” At this point I fully expect a little finger to have been crooked by the lip, Dr Evil style. 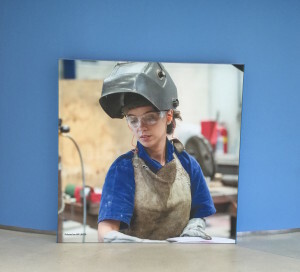 So maybe not a million, but enough to provide a wide format printer with a full width print head. Oh yes they did. The result is absolutely mind-blowing to anybody who has ever printed a network diagram. Watch this video, and cry a little on the inside because you don’t have one yet. You may also as a result wish to find a baseball bat, a truck large enough to transport your old DesignJet printer, a sturdy pair of boots, a kicking sound system, a copy of the Geto Boys’ track “Die Mother******”, and a location in which to allow the boots, the baseball bat and the DesignJet to meet with an appropriate soundtrack. I think you know what I’m talking about. Nope. Not even close. When I saw this product, I guessed that it was going to be in the $800+ range, and I was wrong wrong wrong. The slightly slower OfficeJet Pro X476dn delivers a disappointing 36ppm at full quality, and (I think) 55ppm in Office Mode. List price is $449 for print-only, or $649 in multi-function printer (MFP) form. The big brother product, the X576dw which churns out 42ppm Professional and 70ppm Office mode is $599 for printer only, and $799 as a MFP. However, these are list prices, and as an example, Amazon currently has the X476dn-MFP for $381. Under $400 for a 36ppm (color or black) printer with duplexing capabilities? Shut up and take my money! I don’t find myself saying “wow” out loud very often, but this product did it to me, especially in the wide format version. 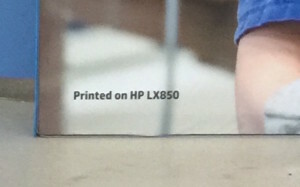 I wasn’t at HP Discover intending to review a printer, but this product just screamed out to me as something I should write about. HP claim that this product performs like a laser but for half the cost. I haven’t done the sums in detail, but at the street price I quote above, it would likely be tough to prove otherwise. I’m seriously looking at an X476dn-MFP for my home, to replace my aging Color LaserJet c2600n which is complaining about low toner for 3 of 4 colors. If I’m about to spend $240 or so just on toner cartridges, what’s another $100 to get an entirely new printer? I attended HP Discover Barcelona as a guest of HP’s Independent Blogger Program, and they paid for my travel, accommodation and food for the event. As usual though, I get to say whatever I want without any input from HP. See my main Disclosures page for more information. 1 Comment on This man pressed Print. What happened next left me speechless. I’ve been actively waiting for my Epson CX11NF colour laser printer to fall over and die, or to need an expensive new ‘middle bit’ so that I can push the button on one of these. The fact they do all this and duplex too is tremendous.